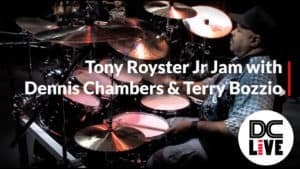 Dennis Chambers is widely known as one of the most influential drummers of all time. He has recorded and performed with Parliament/Funkadelic, John Scofield, George Duke, Brecker Brothers, Santana, John McLaughlin, Niacin, Mike Stern, CAB, Greg Howe, and many others. Despite a lack of formal training, Chambers has become well known among drummers for his technique and speed. Chambers is particularly regarded for his ability to play "in the pocket" but can also stretch very far out of the pocket which is also a hallmark of his technique.